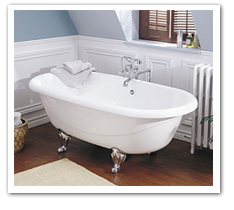 Refinishing a bathtub can take as little as 4 to 5 hours. You can shower or bathe the very next day. Replacing a tub however, can take weeks, when you consider the demolition involved. Removing and replacing the tub can include having to readjust or replace plumbing, tile, and repairs to the floor surface. It can be very impractical and inconvenient having no use of your bathroom for an extended period of time. Refinishing your countertop and or tile backsplash in your kitchen can take as little as 1 to 3 days depending on the amount of work being completed. Replacing, depending on tile backsplash and what is effected by removal may take much longer. When refinishing in your kitchen, we do not have to destroy any of the surrounding area, which saves time and money. Call for a free estimate & more details today!